I’ve always been more of a brunch person than a breakfast person. For some reason, that early morning meal doesn’t appeal to me most days–I’m just not hankering for a plateful of food until closer to 10. However, give me breakfast food–and definitely brunch food–any time during the rest of the day and I’m ready to load up my plate. 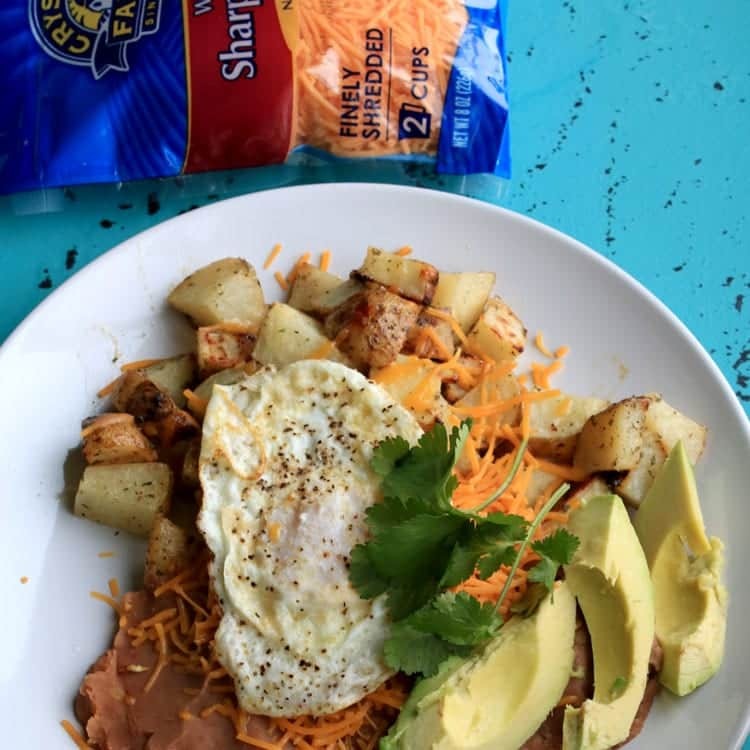 The perfect combination of savory ingredients for a brunch meal in my opinion is our Huevos Rancheros with Ranch Potatoes. 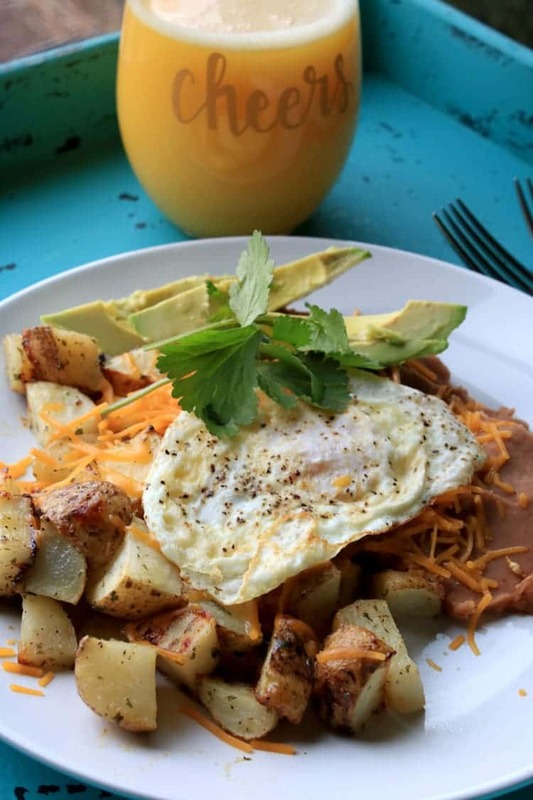 We’ve got potatoes, re-fried beans, and cheese, all topped with an over-easy egg, avocado and cilantro. I’ve been cooking with cilantro quite a bit lately. I LOVE going to the store to buy cilantro because I break a leaf off, or rub a leaf between my fingers just to break loose the AMAZING aroma that cilantro has. Yes, that’s me in the store, taking a huge whiff of the fragrant herbs before putting them in my cart. Of course, it’s even better in the summer when I can go straight out to my garden to pick cilantro. Nary a meal in my home is complete without the addition of cheese. There is just something about the flavor of cheesy goodness that is out of this world amazing and melds all the other ingredients together–perfectly. I love using Crystal Farms® brand because their products are gluten-free, which is a HUGE plus since my daughter is now on a gluten free diet. Their products are also lactose tolerant and have few preservatives. 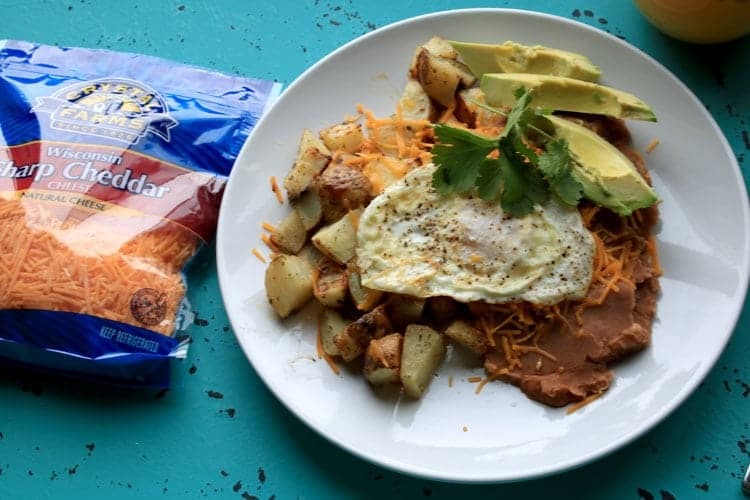 Making Ranch Potatoes AND Huevos Rancheros is a breeze. I’m not going to lie. This is one of the easiest recipes you will ever make. To start, preheat the oven to 350 and then wash and dice 4-6 medium-sized russet potatoes. Put then in a bowl and add some olive oil and ranch seasoning. 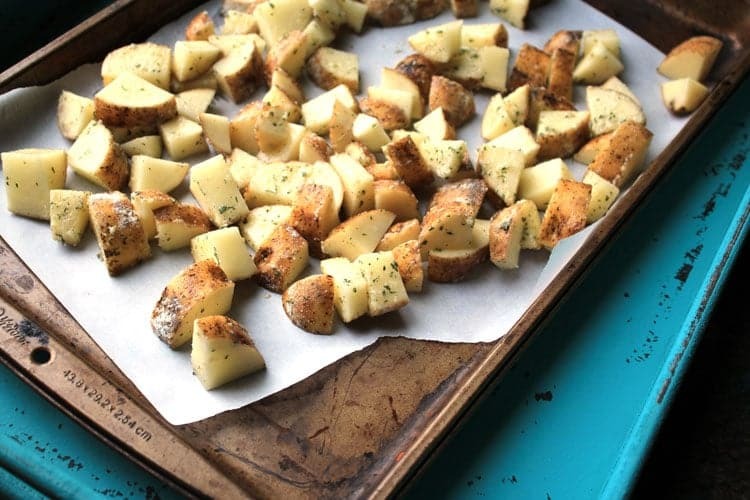 Toss to combine and then spread the potatoes out on a baking sheet lined with parchment paper. Bake for 20-25 minutes, or until fork tender. Seriously, these potatoes cook up so easily and they have a nice flavor that would make for a nice side dish for any meal. I’ve made similar potato recipes during the summer, wrapped them up in foil and tossed them on the grill with whatever meal we’re cooking. Yum. Once the potatoes have been cooked, it’s smooth sailing. Heat up some re-fried beans in a saucepan on the stove top. If you’d like a thinner consistency for your beans, add a little bit of water at a time, stirring the beans to incorporate the water throughout. Once the beans are heating up, it’s time to cook an egg. I did just one egg, over easy, but you could cook a couple of eggs if you have a larger appetite or especially if you’re cooking for more than one person. We’d recommend 1-2 eggs per person. 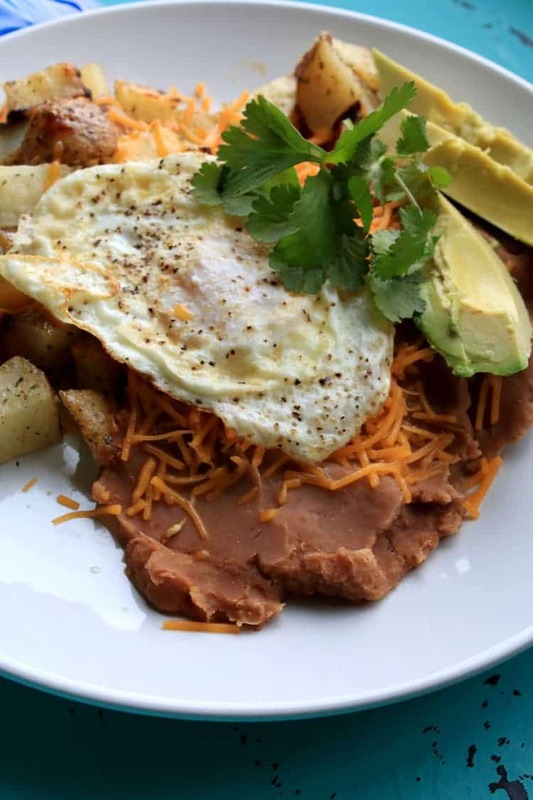 Plate the potatoes and beans, and then top with shredded cheese, egg and avocado and cilantro. Add some salsa, if desired. Enter to win our Giveaway. You could win a Bodum Brazil 8-Cup French Press Coffee Maker,Black ($19.99) and 2 Le Creuset Stoneware Mugs, Caribbean ($29.99). *Entries open to US residents only. Grab the recipe and dish up a plate of yum! Heat beans in saucepan over low heat on stove top. Preheat oven to 450 degrees Fahrenheit. Line a baking sheet with parchment paper. Dice potatoes and put in a bowl. 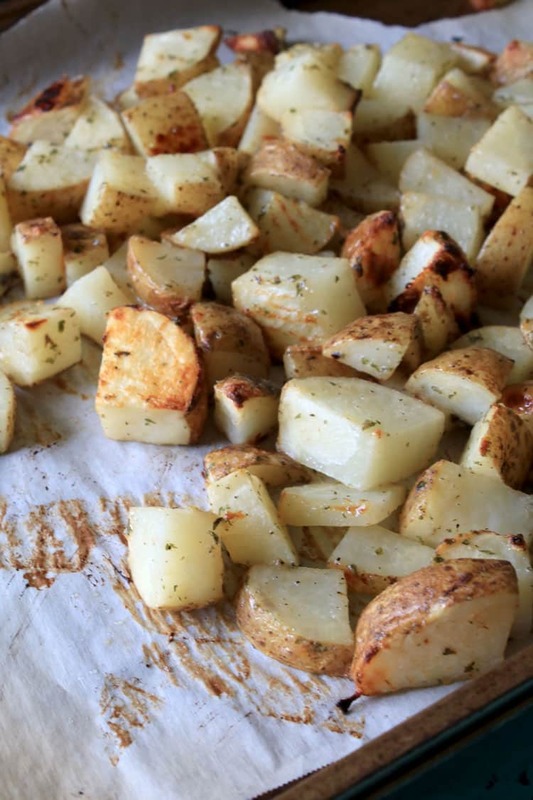 Toss potatoes with olive oil and ranch seasoning. Pour onto lined baking sheet and spread evenly. Bake for 20-23 minutes or until fork tender. Plate refried beans and potatoes. Fry an egg, over easy, for each serving. Add the cooked egg on top of beans and potatoes. Add sliced avocado and salsa (optional). Lasagna and enchiladas are always better with more cheese! I love adding more cheese to loaded baked potatoes. Casseroles and pizza, the two that always get extra cheese.